That would be Le Mars. And that’s not French, it’s a town in Iowa. What — you don’t instantly recognize the “Ice Cream Capital of the World?” Too bad, because just across the street from Le Mars’ famed Blue Bunny Ice Cream Parlor & Museum is a less glamorous office suite. That would be the world headquarters of the Browns — the family gospel group who’ve been touring North America full time for the past decade. You just know kids this hale and hearty had to be raised on a farm. It takes a lot of corn to feed all the cows who supply all the milk to the world’s ice cream capital. Just two years after the birth of their first child — daughter Jessica — Keith Brown and his blushing bride Shelly celebrated 100 consecutive years of family ownership of their nearby farm. Over the years as another daughter, Michaela, and sons Adam and Andrew came along, music and singing grew alongside the corn and soybeans. In those early years, singing locally and in neighboring states, “we had a very lighthearted sound, because the kids were so young,” says Shelly. “Growing up, we’d save all of our pennies for the whole year, and come to the National Quartet Convention to buy all of our favorite CDs,” Michaela says. “We had a whole list of booths to visit — the Hoppers, the Talley Trio, Gaither Vocal Band, Gold City, the Perrys.” The youngest, Andrew, singles out Ernie Haase and Signature Sound. “High energy. That’s my kinda style...” while Adam chimes in, “the Crabb Family was my favorite, and the Cathedrals — which was the first group I ever saw in concert.” Uh-oh, once they’ve been to NQC, how are you gonna keep ’em down on the farm? 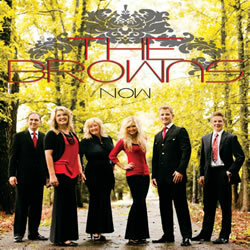 Traveling, performing, recording and farming came together quite nicely — with the Browns twice listed in the Singing News’ “Top 10 Mixed Groups” and three times on the “Top 5 Horizon” list. But when kids grow up and suitors show up, the bestlaid plans can go up... in smoke. Jessica was swept off her feet by Nick Trammell, baritone with the Perrys, who left the road and took his bride south to his sweet home in Alabama. While Nick pursued a degree in accounting, he and Jessica would perform as the Trammells whenever they could, joined by pianist and lead singer Scott Brand. At the end of 2010, after completing studies and preparing for a life of spreadsheets and ledgers, it became plain to Keith Brown that the couple’s heart still beat for singing the gospel. So he let it be known that whatever his son-in-law decided, the family’s bus door would always be open. So from Brown Central, opposite the ice cream parlor, came a press release in March, 2011. Nick and Jessica Trammell would become touring members of the Browns — making life in Le Mars just a little more joyful, joyful.